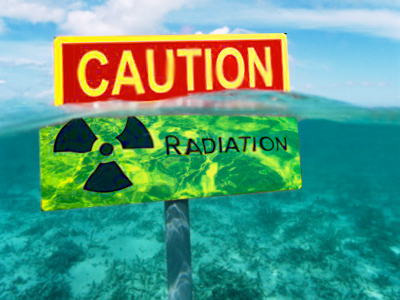 Dangerous radioactive strontium has been detected in seawater near the Fukushima-1 plant, at 240 times over the safe limit. Some 100,000 tons of contaminated water stored in the plant threatens to put out its drainage system in days. 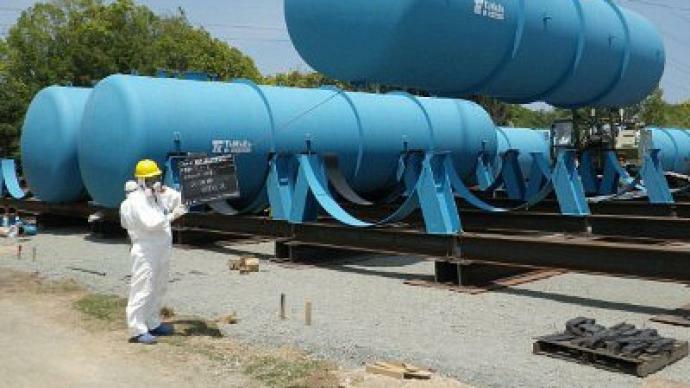 ­Tokyo Electric Power Company (TEPCO), which operates the Fukushima-1 nuclear power plant, has declared that strontinum-90 was detected near the water intakes outside reactors 2 and 3. The levels there were shown to be 170 and 240 times higher than the limit, correspondingly. The same strontium was found in groundwater near the reactors' buildings. Strontinum-90 was also detected in samples taken from inside an inlet near the facility. The level of strontium contamination there was 53 times higher than the safety standard. The inlet has been used exclusively by the plant. All the water samples were taken back in mid-May. According to TEPCO, it takes up to three weeks to run full tests. With a comparatively long half-life of 29 years, radioactive strontium can accumulate in the bones if inhaled, and poses a risk of cancer. The rainy season is approaching and concerns have surged that the contaminated water in the Fukushima plant that has been accumulating may overflow. The drainage system is expected to overpass its capacity by June 20. 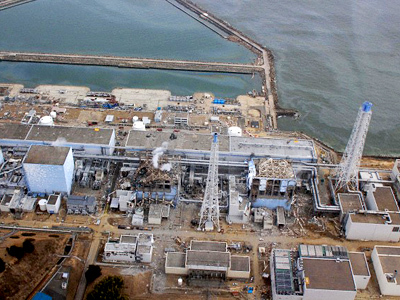 Still, TEPCO had to postpone the test-run of a new system to process highly radioactive water. The operator wants to conduct a test-run on Tuesday or later, which is more than four days behind schedule, Japanese news agency NHK reports. The test had to be delayed as water seepage from a pipe joint was discovered along with the failure of a pump to siphon water. This delays the working launch of the system until June 17-18. Over 100,000 tons of highly radioactive water is now stored in the plant. Some 500 tons of water add up every day due to the cooling systems of several reactors that leak. The water has also been coming due to the rains pouring in Fukushima-1 area. If the water overflows it may go straight into the Pacific Ocean. 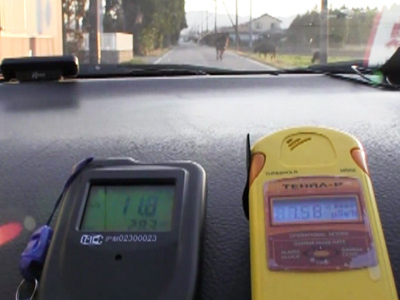 ­Reporting from Fukushima city, which is 80km away from the Fukushima-1 nuclear plant, RT’s Sean Thomas says radiation levels are very high in the city as the contaminated particles are carried there by wind and rain. At some places the readings are 1,000 times over the dose safe for health. Moreover, readings may differ dramatically at objects standing just a meter away from each other: a house giving 30 times over the dose, while a building next to it surging to 500 times over the safety limit. Grass is one of the concerns of the local residents as it attracts and absorbs radiation. The maximum acceptable dose for the public from any manmade facility is 1,000 microsieverts per year as set by the IAEA. The lowest annual dose that can cause cancer is 12 microsieverts per hour. 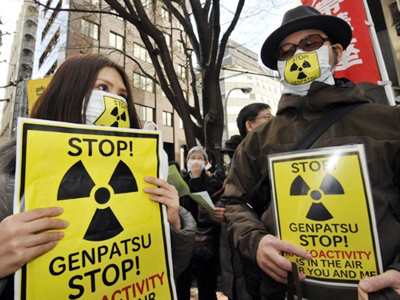 Scientists are working to try to clean up the radiation. Authorities are looking into whether Fukushima city should be included in the evacuation area or whether people in at least some hotspots in the city should be evacuated. James Corbett, editor of the Corbett Report, says the effects of the people’s exposure to radiation, including the increase in cancer rates, are yet to show up. “It really is just a question of how many and at this point we obviously can’t say because now we don’t even know the extent of the scope of the radiation danger, but as that report reveals, it’s obviously much higher than it has been previously supposed,” he added. ­Arnold Gundersen, an energy adviser at Fairewinds Associates, a corporation specializing in environmental and nuclear safety, explained why radioactive Strontium-90 is so dangerous to human beings.